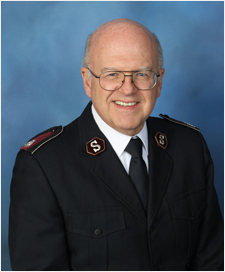 December 2001 saw Commissioners Roberts move to the southern part of the Americas and Caribbean zone, when they were appointed respectively as Territorial Commander and Territorial President of Women’s Organizations, South America East Territory. Four years later the commissioners reported for duty at International Headquarters – Commissioner William Roberts as International Secretary for Business Administration and Commissioner Nancy Roberts as IHQ Chaplain and Secretary for IHQ Staff Development. In March 2008 the commissioners became the first territorial leaders of the newly formed Kenya West Territory where their leadership and ministry made a deep impact on Salvationists in the western part of Kenya. From there they returned to their native USA as the national leaders. Commissioner William Roberts is a leader of varied expertise and wide knowledge. As well as having a Bachelor's degree in Business Administration and a Master's degree in Religious Studies, the commissioner has interested himself in minority ministries, cross-cultural ministries, leader development, evangelism and church growth, and social service.